Ashbourne Court Care Home provides residential and nursing care to older people, including people with a form of dementia, with carers accustomed to dealing with sensitive mental health needs. Palliative and respite care are also available. This comfortable facility offers en-suite bedrooms, tailored care packages and an active lifestyle, together with a warm social atmosphere and friendly service. The recreation and activities team oversee everything: from bingo and knitting to skittles and sing-alongs. Residents and their families can participate in the planning process, to make sure that the home is providing something for everyone. Meals are prepared by trained chefs, offering residents a varied daily menu of nutritious and tasty food. Special diets can be catered for. Ashbourne Court offers brighterkind care - an individually tailored, person-centred approach to care. When you arrive at Ashbourne Court, the team will work with you to develop a personalised care plan that will include everything from your hobbies, exercise, and dietary preferences, to any health issues you might have. It will determine the level and type of care you receive. This can vary from minimal residential care to full support. 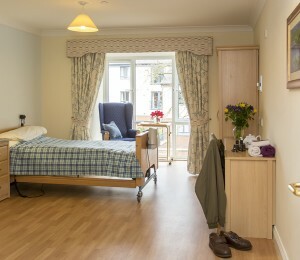 We have 64 bedrooms set across three floors, divided between our residential, nursing and dementia care suites. 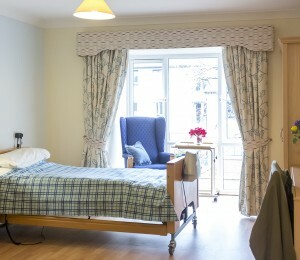 All the rooms are en-suite wet rooms, but for residents who find bathing difficult, or prefer a bath, there are also bathrooms and shower rooms within the home where full assistance can be provided. All our rooms are furnished to the highest specifications with your comfort in mind, and each room has individual décor. Your bedroom furniture consists of: an appropriate bed suitable to your needs, wardrobe, three drawer chest, bedside table with lockable drawer, over-bed table, armchair and other furniture suitable to the size of the room. There’s also space for a TV and telephone socket for your convenience. We understand that moving into Ashbourne Court will be a considerable transition, but one we try to make feel as easy as possible. Your room is your own personal space, which is why we encourage you to personalise it if you like, by hanging your favourite pictures or bringing small pieces of furniture. We encourage people to make the rooms their own. Quite a few of our residents will ask us to take out pieces of our furniture to make room for some of their own from home. Others bring loads of stuff and really make it their own.